Our KHOU 11 weather team is keeping watch over the Atlantic Ocean as computer models hint at possible development early next week. HOUSTON. -- The tropics have been quiet across the Atlantic and Caribbean so far in August, but that doesn't mean September will stay that way. "A tropical wave will enter the Gulf of Mexico Monday and has potential to develop into a tropical system," said KHOU 11 Meteorologist Brooks Garner. "However, it's too soon to forecast what it may become or where it may go. Regardless, it could bring heavy rain to parts of the Gulf Coast late next week." It's not all that surprising that there are more hints of tropical activity this time of year. 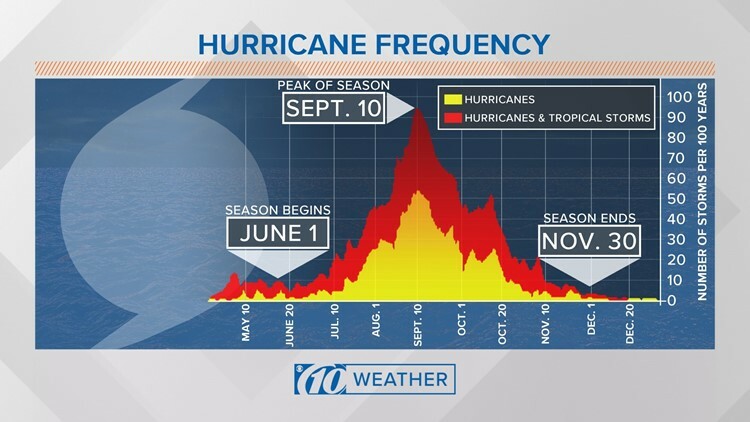 The peak of hurricane season is Sept. 10, which is when there's the highest number of storms on average. The peak of hurricane season is Sept. 10 as history shows the tropics are more active during that period than at any other time. National Hurricane Center and KHOU 11 meteorologists are keeping their eyes on a more likely area of development right now off the western African coast. This area near Cape Verde has a likely chance in the next five days of developing into a tropical depression while a system moves over open water. No matter what happens with these two systems, tropical moisture will dump heavy rain on the Greater Houston Area through Labor Day.